While people have been visiting Hilton Head Island for thousands of years, the history of the island itself can be traced through geology for nearly 50- millennia. Four hundred fifty years ago, the sea level was 400 feet higher than today. The ocean extended to present-day Columbia, SC, which is located approximately 250 miles northwest of the island. Until the late 1700's, the most common challenges for those who inhabited this remote island were extreme isolation, or conversely, occasional attacks from raiders - Spanish, Indian or pirate. The Spanish were the first confirmed European visitors. In 1521, a Spanish expedition entered Port Royal Sound, initiating contact with local Indians. Spain claimed all of the eastern coast and called it Florida. The Spanish located their capital city, Santa Elena, at a midway point on the seaboard at what is now Parris Island, giving them control of Port Royal Sound and a "window on the Atlantic." Over the next 20 years, Indian uprisings ultimately forced the abandonment of the fortified town. The Indians were initially intrigued by the "white men" who sailed in from the east, and they offered the Spanish friendly and often indispensable advice about life on this isolated island. However, the Spanish quickly became the Indians' mortal enemy when they began to abuse and kidnap the Indians to sell them into slavery in the West Indies. In 1663, English sea captain William Hilton was commissioned by a group of Barbados planters to find new land on which to plant sugar and indigo. Pursuing this commission, he sailed from Barbados and landed on Hilton Head Island. Captain Hilton was greeted by Spanish-speaking Indians from the Yemassee tribe who had migrated north from Florida a hundred years earlier at the behest of Spanish colonists. Hilton soon claimed the Island in the name of the British Crown, and the Spanish were eventually forced to accept that the English were here to stay. The island bears Captain Hilton's name to this day. By 1860, there were 24 plantations in operation on the island, populated mostly by slaves and overseers who harvested the main crop - cotton. Indigo, sugar cane and rise were also being cultivated. Because of the heat, as well as the land's low elevation, the wealthy landowners spent little time on the island. Seven months after South Carolina seceded from the Union, the shots fired on Fort Sumter reverberated on Hilton Head Island. On November 7, 1861, the island became the scene of the largest naval battle fought in American waters. More than 12,000 Union soldiers and marines landed on the island, and in less than five hours, the Union fleet captured both Fort Beauregard near Beaufort and Fort Walker on Hilton Head Island. The island fell into the hands of Federal troops, forcing island families to evacuate their plantation homes. In 1862, with the occupation of Civil War troops, missionaries, prisoners and escaped slaves, Hilton Head's population swelled to over 40,000. The Civil War and the subsequent abolition of slavery altered the prosperous and patrician lifestyle of the plantation owners forever. By 1868, military occupation of the island ended, and the population again dropped to only a few thousand. Many cotton plantations were up and running again until a small gray beetle called the boll weevil decided to make the southeastern United States its home. The insect's preferred diet of cotton bolls caused the destruction of cotton crops all over the South. Hilton Head island lapsed into obscurity, largely separated from mainland developments for over 90 years. During this period, the island maintained a small population of African Americans who were, for the most part, descendants of former slaves. They survived modestly on small farms and as hunters and fishermen. Their culture and language, both known as Gullah, survive today as a living legacy of their strength an perseverance. Many residents on the island turned to truck farming to create cash crops that kept the agrarian economy alive. Large-scale commercial oystering also became an economic mainstay. Whiskey production was another industry that developed on Hilton Head in the early decades of the twentieth century. The 18th Amendment to the U.S. Constitution outlawing the consumption of alcoholic beverages only increased the demand for Sea Island liquor. Many island families would not have survived the Great Depression of the 1930s without income from moonshine. During the 1940's and early 1950's, the island experienced a re-birth after a group of timbermen recognized great potential in the island's tall straight pines. Popularly called sea pines, the trees produced lumber for a variety of uses. These lumber associates from Georgia, including General Joseph Fraser, bought 20,000 acres on Hilton Head's southern end for $60 an acre. Electricity was brought to the island in 1950. In 1956, Charles Fraser, son of one of the families who owned the island, realized that Hilton Head Island had more to offer than just timber. Armed with vision, energy, and investment dollars, he created a master plan for a resort community, Sea Pines Plantation. That same year, a two-lane swing bridge, the James Byrnes Bridge, was constructed, opening the island to the mainland. It was replaced in 1982 with the current four-lane bridge. 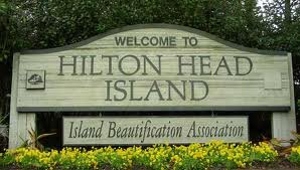 In 1975, Hilton Head's population was 6,500, with 250,000 visitors to the island annually. In 1999, the population has swelled to over 30,000, with 2 million visitors annually. In addition, the Cross Island Parkway opened last year after eight years of planning and construction. Connecting the north and south ends of the island, it has proved a boon to both visitor and residents alike. 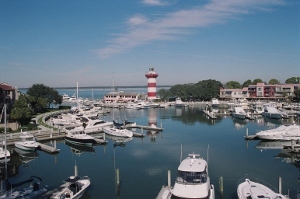 Hilton Head is now home to several environmentally planned resort and residential communities. While these planned communities are often called "plantations", the cotton fields have been replaced by lush green golf courses, tennis courts, lakes and lagoons, and beautifully designed resorts and villas. Hilton Head's vast, sparkling beaches, sweeping marsh vistas and gnarly, moss-draped live oaks seem almost primordial. This natural landscape is every bit as attractive today as it was for the early settlers and antebellum cotton plantation workers. On this island, old and new meld together to form a delicate balance. Past and present. Tradition and progress. Together they make up the extraordinary paradox that is Hilton Head Island. Welcome.